Perfect snack for watching the big game! 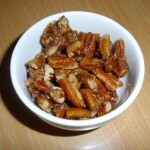 Add the pecan pieces and salt. Stir continuously for one minute on medium heat. Add sweetener and stir for another 6 minutes.